Why am I interested in adopting a greyhound? Is it for myself, for the kids or to replace a deceased canine cherished by the whole family? It is important to be sure not only that your reasons are sound and not motivated by whimsy or impulse, but that your expectations of greyhound ownership are reasonable. For instance, if you expect that getting a dog will teach your children responsibility; that’s a parent’s job. Ask yourself why you are interested in greyhounds specifically. Make a list of the pros and cons of owning an ex-racer. Although they make fine pets, they are not for everyone. Does everyone in the family really want a greyhound? Invariably, despite good intentions and promises to the contrary, at least 75% of a dog’s care tends to fall on the domestic leader of the household. More often than not, that’s the woman of the house. To pick up the remaining 25% of the responsibilities, it’s important that all other members of the family really want the dog and are willing to pitch in. A dog that starts off being unwanted or resented by even one member of the family can hardly expect to live a happy life. Will a greyhound fit my family’s lifestyle? Do you maintain a regular schedule? After all, dogs are creatures of habit. Would you rather go directly home at the end of the day to walk the dog, or get together with friends for a beer or a game of tennis? Will anyone be home during the day with the greyhound, especially if you are gone very long hours? If no one is home, do you have a friend or neighbor who can come in during the day to walk the dog? Do you truly have enough free time and energy to put into the necessary care, training and companionship of a greyhound? Greyhounds are happiest in environments where they can be with their owners as much as possible. Can my fastidious nature tolerate having a dog in the house? If you’re someone who keeps an immaculate home, be prepared for a big change in your outlook, or rethink the whole idea, because greyhounds absolutely cannot be kept in an outdoor kennel. Greyhounds are clean dogs by nature, but they are still dogs, capable of dragging in mud and having an accident on your oriental rug. Am I prepared for the expense of greyhound ownership? Food, licenses, obedience classes, routine veterinary costs and emergency vet visits can quickly put the financial feasibility of dog ownership out of the question for many. Do I accept all the responsibilities that come with being a good dog owner? This includes licensing requirements, local laws, the etiquette of being a good neighbor (stooping and scooping! ), the willingness to provide proper nutrition, grooming, vet care, etc. Owning an ex-racing greyhound means agreeing to never allow the dog to run free unless in a safely fenced area. If you can’t adhere to this requirement, then a greyhound is not for you. Am I prepared to do the research? A basic reading requirement for those seriously interested in an ex-racing greyhound is Cynthia Branigan’s Adopting the Racing Greyhound. You should also visit a greyhound to get a better idea of what they are all about. 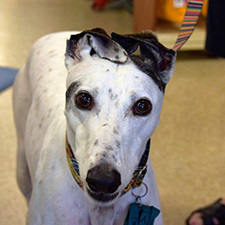 GPA-Wisconsin is available to answer your questions and help you decide whether a greyhound is in your future.